Ever wonder if you're good enough? Funny enough? Smart enough? I do... all the time. I am constantly comparing myself to others and I'm always falling short. It's exhausting, really. 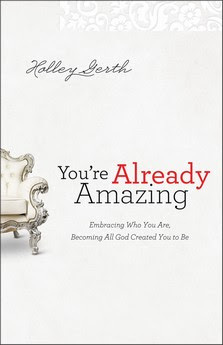 Author Holley Gerth's simple truth in her book is that we are already amazing, simply because God made us that way. All our traits and characteristics? They've been given to us for a purpose, and from them we develop our strengths and gifts. I really enjoyed the way this book is written: not preachy or like Holley is talking at at me as the reader. She is open, authentic and vulnerable, and I appreciated that. It's as though it was just Holley and me, sitting across a table at a coffee shop, while she encouraged me with God's truths. As women we need to spend less time tearing one another down, and more time building each other up. We are daughters of the King and we need to treat each other as such! I like that she encourages the reader to create a Life Statement. I've been struggling to write my "mission statement" for years now, and I'm encouraged to finish it, and to live it out authentically and honestly. One of the many lines that struck me with it's simple truth: it's not about being perfect, but about being perfectly loved. I am enough. And you know what? So are YOU! "Book has been provided courtesy of Baker Publishing Group and Graf-Martin Communications, Inc. Available at your favourite bookseller from Revell, a division of Baker Publishing Group". Posted by Kate at 8:26 p.m.